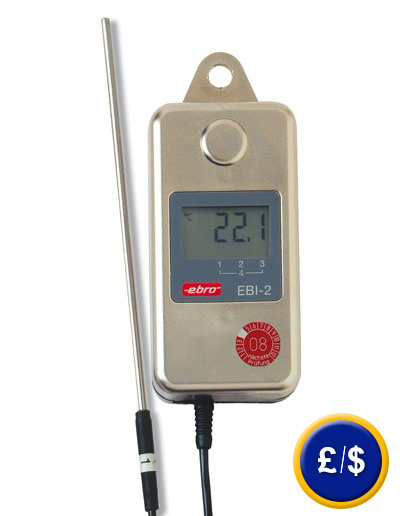 The temperature data logger series EBI 2T - 3 is a handy tool that runs on a lithium battery. The electronic temperature recorder is controlled by a microprocessor. This ensures high measurement accuracy and linearity in all the measurement range of the temperature data logger. The temperature data logger makes the connection to a computer with a RS-232 interface. The WINLOG 2000 software enables the programming and lets you read the information. If you have any questions about the temperature data logger, see the following technical data or call: UK customers +44(0) 23 809 870 30 / US customers +1-410-387-7703 . Our engineers and technicians will be happy to help you with the temperature data logger, and of course, on the other products in the field of regulation and control, measuring instruments and scales or balances.